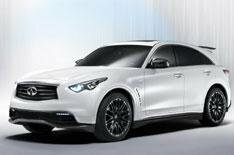 Infiniti FX Sebastian Vettel | What Car? Inifiniti had help from Formula One world champion Sebastian Vettel in designing the FX Sebastian Vettel concept car. It's a one-off special edition made for Vettel and it's making its debut at Frankfurt. The FX Sebastian Vettel is based on the FX50, but has a range of cosmetic and mechanical upgrades inspired by Formula One and specified by Vettel. Vettel's EX has the 5.0-litre V8 engine from the standard car, but it has had a power increase to 414bhp. The car is 46kg lighter than the standard version, has lower and stiffer suspension and has a bespoke interior.